Sophie Llewellyn Smith is a conference interpreter with 15 years' experience of interpreter training. On her site theinterpretingcoach.com, you will find eBooks and eCourses to help you consolidate or update your interpreting skills in areas such as note-taking, research skills, analytical skills, and retour interpreting (working into a B language). Each course breaks the skills down into manageable sections and uses a mixture of text, audio and video to examine underlying principles and work on practical exercises. In this way, you can use self-study at your own pace to target your weaknesses, improve your performance and become more marketable. Nowadays, everybody’s busy busy busy! 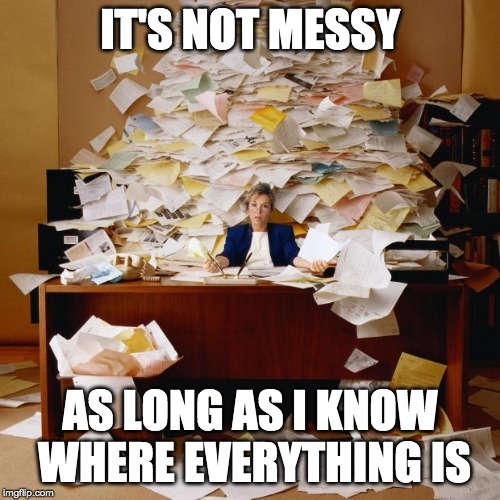 We’re all juggling multiple assignments, jobs, devices, apps, websites, passwords…It’s exhausting sometimes. And I’ll admit it: in the past few months, I’ve dropped a couple of balls, generally because I’ve lost track of what I was supposed to be doing. I often have panicky thoughts about whether or not I’ve actually booked the children into daycare after school, or whether they will be standing at the school gate at 3.15, looking pathetic and wondering if their mother has abandoned them. However…it hasn’t happened yet. Because most of the time, I’m actually pretty organised. Note that I didn’t say tidy, but organised (an important distinction, in my husband’s mind anyway). Today I’d like to share with you my top three tools for staying on top of my to-do list, appointments, and web logins. 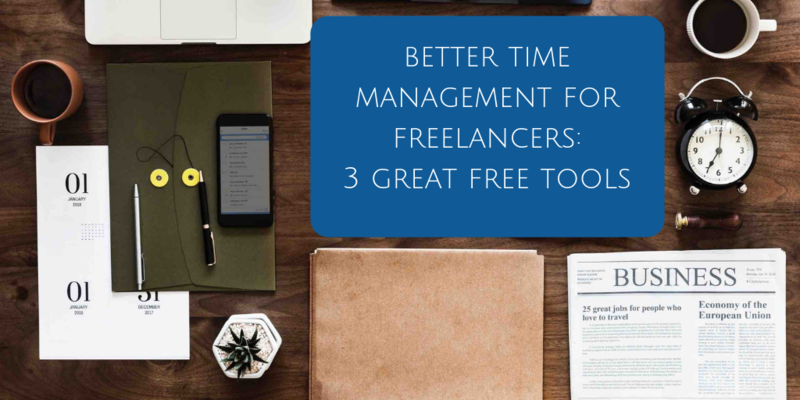 Best of all, they are all free and very simple to use, and they will definitely improve your time management! How many websites are you registered with? Do you reuse the same password all the time (a very real security risk)? Do you write your passwords down somewhere ‘safe’? Do you forget important passwords all the time? This was me, a year ago. I would reuse the same login credentials, with a memorable (but weak) password, for all the websites where I do my online shopping. This is definitely a bad idea when many of these sites store your credit card details. I was also running several websites, one of which had been hacked. It became obvious that I needed a more reliable and more secure way of generating and storing passwords than simply writing them down, even in coded form in a password-protected document on my computer. Apart from anything else, it was inconvenient only having access to my passwords when I was using my laptop. The premise of a password manager is that it is yet another website, for which you need to remember yet another strong password, but…it’s the only one. Once you’ve created a memorable login for the password manager, it will do all the work for you when logging into websites. Now, you might already store passwords in your browser (such as Firefox), but you won’t be able to access them on another device, and if your laptop or phone is stolen, your passwords aren’t secure. The password manager avoids these problems. Clearly, you can only use a password manager if you trust the company’s security measures, so do your research before signing up. We’ve all heard of plenty of breaches of security all over the Internet, so it’s worth being cautious. On the other hand, what are the odds that their security measures are weaker than yours? you can access your passwords from any device, once you have signed into LastPass. it auto-fills login panels when you visit websites where you have previous registered. when you visit a new website, a pop-up comes up asking if you want to store the password. you can share passwords securely with a friend. the site can also serve as a vault to store information such as passport numbers, driver’s licence numbers, or WiFi passwords. 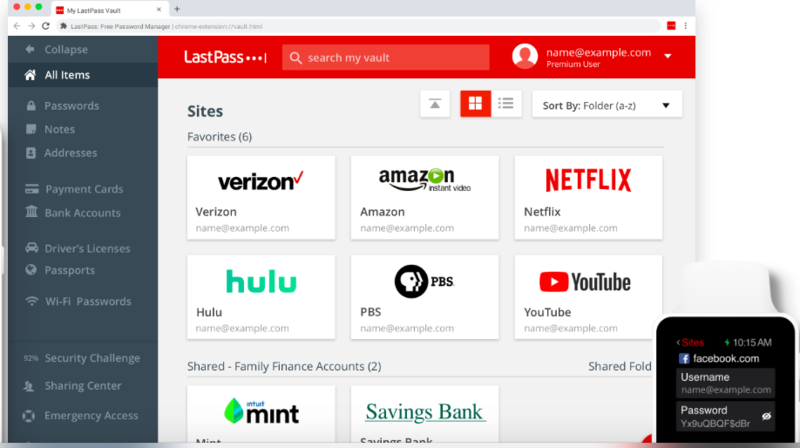 The paid version of LastPass will, of course, offer you more functionality. For example, in case of emergency or in a crisis, your trusted friends and family can access your vault (sorry to be morbid, but I imagine that would come in useful if I suddenly popped my clogs, if nothing else because so many of our financial transactions are conducted online these days). You can also share your passwords with several people at once (‘one to many sharing’), which would be useful if you were running a team, for example. However, I find the free version quite sufficient for my needs, and I don’t even use all the functions; for instance, there are plenty of free strong random password generators on the web, so I don’t use LastPass’s. it’s important to logout in the evening, otherwise anyone using your device could access all the websites you’re registered on. don’t store very sensitive credentials in your vault. In particular, you should avoid storing online banking details on a password manager, because your bank won’t cover you if there’s a security breach. There are other options out there, such as Dashlane and RoboForm; they have different features, but since their core business is the same, they’re much of a muchness. You may be ruled by lists, as I am, or you may not; but EVERYBODY, surely, writes down what needs doing in some form or other, at some point – maybe using the Notes function on your phone, or on the back of an envelope, or on a notepad stuck to the fridge. 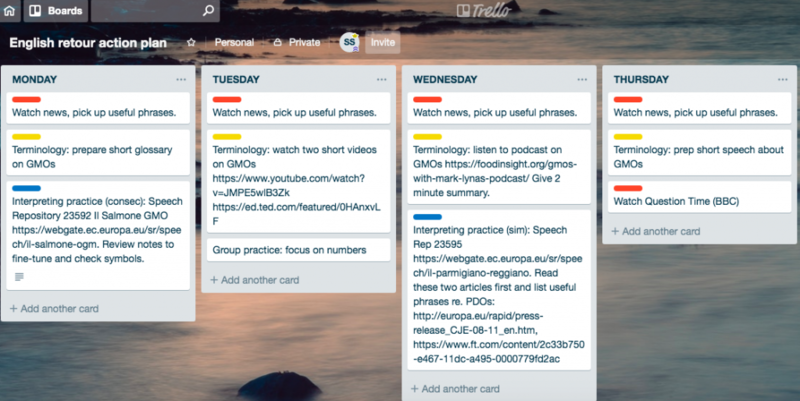 I use Trello to organise my life and my coaching sessions, and I love it (full disclosure: you may have noticed I’ve given you a special link, but I’m not an affiliate and I won’t receive any money for doing so!). Imagine writing a to-do list in the form of bullet points. Then imagine having several of these lists alongside one another, on a single screen (or ‘board’). You will see from this image that you can label your items (known as ‘cards’) in a particular colour; here, I’ve put terminology work in yellow, background knowledge in red, and interpreting practice in blue. That way, you can see at a glance what the balance of activities is. you can create multiple boards and share them with friends or colleagues. you can drag and drop cards, which means you can move an item across to another day if you haven’t completed it. you can attach virtually anything to a card: an audio file, a document, basically anything that’s on your computer. You can also attach a file from Dropbox or Google Drive, or attach a link. you can add due dates, checklists, comments and descriptions to a card, and share it with someone. you can view the cards with due dates in a calendar view. You really don’t need the paid version of Trello, unless you’re desperate to have more exciting backgrounds on your boards. You can have ‘starred’ boards, which gives them a higher priority, and it’s also possible to see recently-viewed boards separately from the ones that you use more rarely. All in all, I find it an invaluable tool for keeping information, ideas, and tasks in one place. I use it to list all the DIY that needs doing in the house, my ideas for blog content, and my personal admin tasks (e.g. the dreaded tax return! ), among many other things. My third suggestion is less likely to be useful to students, but it’s great for freelancers who do a bit of this and a bit of that, or who work on an hourly basis. I couldn’t run my coaching business without it, but it would work equally well for personal tutors, language coaches, and anyone else who works on an hourly basis (or at least, in slots of time). The scheduling tool I use is Acuity. On-screen, it looks like a calendar, with daily, weekly or monthly views. your clients can schedule, reschedule and cancel their own appointments. you can easily control your availability, by blocking off time (see the grey zones in the picture), and by setting your business hours. it takes into account your clients’ time zone. you can save notes on each client. you can create a different link for each type of appointment (e.g. personal training, massage, nutrition consultation), and choose which link to send to each client. The appointments will appear in different colours on your calendar. In short, the free version of Acuity is very powerful and allows you to interact with clients in a very flexible way (but without having to go through your entire diary with them to find a mutually agreeable appointment – ‘oh no, I can’t do Tuesday because I’ll be in Brussels. No, I can’t do Wednesday because I’m teaching. Can you do Friday at 10 o’clock? No? How about next week?’). The paid version has all sorts of bells and whistles, as you would expect, such as integrating with platforms like Zoom, and enabling you to embed the scheduler into your own website. The reason I have switched to the paid version is simply that it allows me to sync Acuity with iCal. This means my Acuity appointments appear on my laptop calendar and vice versa. It’s a life-saver and allows me to avoid double- and triple-booking myself (well, most of the time!). The paid version of Acuity also allows you to take payments, e.g. with Paypal, and generate coupons for your clients. Voilà! I hope you found this review of my top three tools useful! What’s your secret to productivity and good time management? Let me know in the comments section.